Today, at its headquarters in Ludwigsburg, filtration specialist MANN+HUMMEL presented a technology that was created to reduce nitrogen dioxide (NO2) at locations with high levels of pollution. 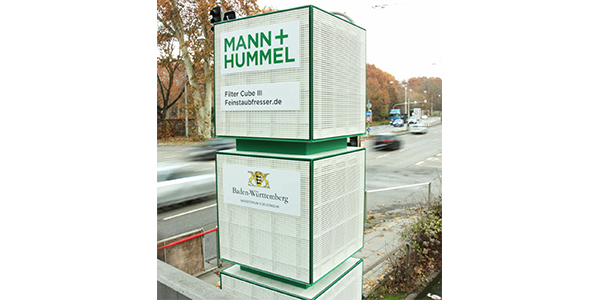 At the end of last year, Filter Cubes from MANN+HUMMEL were successfully installed at busy intersection in Stuttgart to reduce the level of fine dust pollution. The filter specialists have now further developed the technology and integrated a newly developed combifilter medium. The medium retains fine dust and also filters NO2 out of the air. According to MANN+HUMMEL, the innovation helps to protect the people’s health and could make driving bans in inner city areas unnecessary. The Filter Cubes, which were installed last year at the Neckartor road junction in Stuttgart, will be adapted to include the new technology by the summer of 2019, the company says. Before the end 2019, the further developed filters also will be used in a pilot project in Ludwigsburg. The newly developed combifilter includes a filter layer that retains particles and additional activated carbon layers to adsorb NO2. In this process, highly porous activated carbon media are used, and due to their large surface area, are able to efficiently absorb NO2. The technology is characterized by a particularly low drop in pressure. As a result, it is able to efficiently clean the air while using a low amount of energy, according to the company. The Filter Cubes include combifilters and also fans to draw in the ambient air. The filters are able to bind more than 80 percent of the NO2 and fine dust contained in the ambient air that is drawn in, MANN+FILTER reports. Depending on the requirements, using a modular system means a number of Filter Cubes can be installed on top of each other to form a filter column. A filter column with three further developed Filter Cubes is able to clean 14,500 m³ of air every hour, according to the company. Control electronics allow the user to adapt the operation of the filters to match operating conditions and therefore react to the current air quality. Integrated sensors record air and weather data, which are transferred to a cloud and analyzed. The first assessments of the project indicate that the Filter Cubes from MANN+HUMMEL make a considerable contribution toward the reduction of fine dust pollution. They reduce the local particle concentration by 10 to 30 percent, which corresponds to 40 percent of all fine dust particles caused by heavy traffic at the road junction. The majority of these particles are due to braking or road abrasion, and to a lesser degree, exhaust emissions. The positive initial results regarding the fine dust filtration are similar for the effectiveness of the technology to reduce NO2 concentrations, MANN+HUMMEL says. This has been verified by the results of simulations carried out by an independent engineering office. The Filter Cubes at the Neckartor road junction in Stuttgart will be adapted to include the new technology by the summer of 2019. In future, they will be equipped with the newly developed combifilter medium, which will enable the filters to retain fine dust and also adsorb nitrogen dioxide from the ambient air. With the updated combifilter mediums, MANN+HUMMEL expects the local concentration of nitrogen dioxide to be reduced by 10 to 30 percent. That in turn corresponds to 40 percent of all NO2 and fine dust emissions caused by road traffic. Previously, the limit values for NO2 were regularly exceeded at the measurement station at the Neckartor road junction in Stuttgart. A pilot project will start this year in Ludwigsburg where Filter Cubes will be used with combifilters. On the basis of the company’s own calculations and a simulation carried out by an independent engineering office, MANN+HUMMEL has calculated that 23 filter columns will be able to demonstrably reduce the concentration of pollutants along Friedrichstrasse in Ludwigsburg. In recent years, the measurement station located there has exceeded the limit values for nitrogen dioxide. The filter specialists expect a reduction of 10 to 30 percent of NO2 and fine dust, approximately 40 percent of all fine dust and NO2 emissions, which are due to traffic passing by the junction.